The decision of which herbs to use when cooking is often down to what's in the garden right now. A slightly more sophisticated approach is to grow your herbs specifically for certain recipes that you know you'll enjoy. Fines Herbes is a classic combination of French cooking. It goes well in egg dishes—omelettes, quiches—and also with subtle flavours such as potatoes and fish. As with Bouquet Garni and Herbes de Provence, the Fine Herbes combination isn't set in stone (sometimes you see marjoram or dill included in the mix), but parsley, chives, chervil and tarragon are the most common ingredients. It's these last two that make it a herb flavouring that cries out to be grown at home, as both chervil and tarragon very easily lose their flavour when dried. This delicate aniseed-tasting herb can be mistaken for parsley, but its leaves are daintier and the overall impression of the plant is fern-like. It's best not to transplant chervil, but find it somewhere moist and shaded (if shade is sparse, then try to put it somewhere with shade in the afternoon, rather than morning, so that the plants are protected from the main heat of the day). Sow the seeds direct into the ground. Alternatively, especially if you find slugs a problem, it's a good one for containers, so long as you remember to water them. You're aiming to grow plants 6 inches (15 cms) apart. However, the thinnings can be used is salads, so I always sow them a little closer. The great thing about chervil is that it grows quickly and is ready to pick in around eight weeks. You could start sowing in March, but early sowings tend to run to seed quite quickly and you'll need to sow every couple of weeks to ensure a constant supply. Sowing from May or even later will produce happier, leafier plants. Chervil isn't particularly hardy, but if you sow in August and September and protect it from the cold weather with fleece (row cover) you'll be able to enjoy it for several weeks after the summer is over. Going to seed isn't all bad, though. Allow some of your plants to seed and you should find, if the chervil likes the position you've given it, that you'll have a self-sown crop the following year. For me this is the prince of herbs. There's absolutely nothing to beat it in a sauce with chicken and mushrooms. However, it's also a touch confusing. There's Russian tarragon (Artemisia dracunculoides) and French tarragon (Artemisia dracunculus). Don't get the Russian. It's much easier to source, can be grown from seed and is hardier, but it doesn't taste nearly as good (I'd say it doesn't taste of anything at all). Like rosemary and lavender, French tarragon is a perennial and, depending on how much tarragon you're likely to use, one plant is probably enough. Buy a plant. As it's not particularly hardy, I've always kept mine in a pot which I move inside in the colder months. In warmer areas, your bush may flower. Pinch the flowers out to encourage leaf-growth and cut back the bush towards the end of the summer (August/September). This stops the stems becoming leggy and allows new growth to harden up before the cold weather sets in. 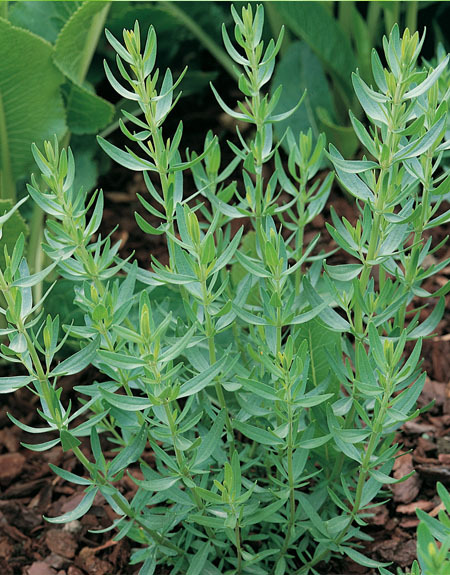 As for many Mediterranean herbs, being too wet can kill tarragon off faster than the cold, so if you do want to grow it in the ground, then be sure that the soil is well-drained, and be ready to protect the plants with a covering of straw throughout the winter. The "garrigue" bed mentioned in Planning a New Herb Garden – Part Two would be a good location for an outdoor tarragon plant. Chop the leaves of the chives, parsley, tarragon and chervil finely. Don't miss out the stems of chervil and parsley, either, as they're full of flavour. Add the Fines Herbes mix to dishes near the end of cooking, as too much heat kills the flavour of chervil quite quickly (for omelettes you can add them when you beat the eggs as they won't be on the heat for very long). French tarragon and Chevril, courtesy of Marshalls.